A reliable Pan & Tilt unit is a key feature in video surveillance systems which need to video a wide or a dynamic location. For installations in aggressive and harsh environments Tecnovideo is proud to offer the VSPT250 Pan & Tilt unit, completely construcetd in AISI316L stainless steel, with 25 Kg load capability is the ideal companion for Tecnovideo housings series 129 and 168. Thanks to an innovative gearbox system and to rugged high torque DC voltage motors, the variable speed VSPT250 P&T unit offers smooth and precise movements at high as well as at low speed, extremely useful when controlling big zoom lenses installed on Tecnovideo large enclosures series 168. 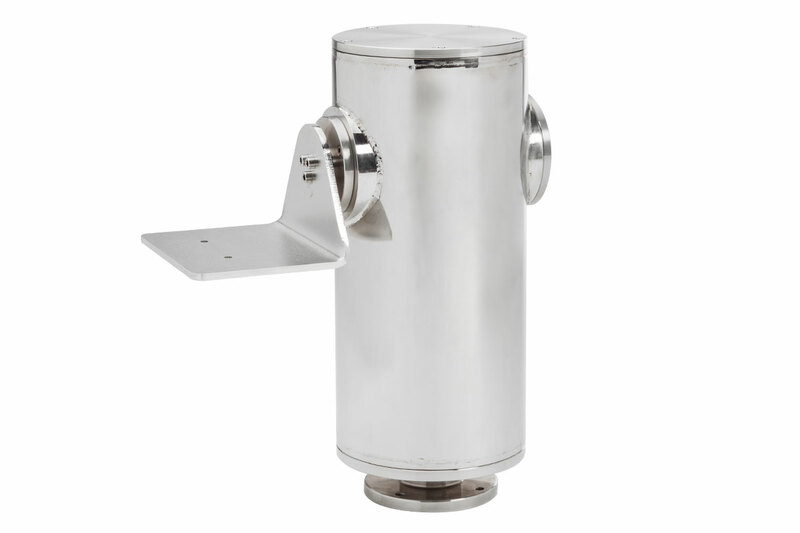 The VSPT250 Pan & Tilt unit is the best choice, especially for Offshore, Marine, Heavy and Food Industry and for every installation where corrosive agents may rapidly damage standard aluminum-steel units. The pre-set positioning of the unit is controlled by precise potentiometers fitted as standard on pan and tilt axis. Electronic limit switches are controlled by the outside of the unit so that the end stop limits can be easily adjusted on-site without opening the unit.